Menjangan Island and Pemuteran – This small island in the north west of the island was the first marine protected area in the province. Surrounded by dramatic walls, beautiful hard corals and some secret macro hotspots. Menjangan is the perfect location for two or three days of diving. With clear waters almost a guarantee, this is one of the top wide angle photography spots in Bali with a profusion of soft and hard corals all around the island. Secret Bay – Situated at the far north western tip of the island, Secret Bay is a shallow bay located beside the main ferry terminal to Java. This sandy bottom cove is thriving with seagrass and is one of the most reliable places to spot seahorses in Bali. Unique to the area is the chance to encounter the rare Banggai cardinal fish, a species that was introduced here in years past. Be prepared for cold water though! The water temperatures are typically a few degrees colder than Menjangan and average around 25C. Puri Jati (PJs) – Puri Jati is located a few minutes west of the idyllic town of Lovina along the north coast of Bali midway between Menjangan Island and the large town of Singaraja. Situated beside a beautiful rice paddy field, the site is a long black sand slope that is famous for its bizarre inhabitants. Ambon scorpionfish, lionfish, pipefish, coconut octopus, and the amazing mimic octopus are just some of the residents that can be found here. As the average depth is less than 10 metres, long bottom times are the norm on this site, one of the most productive for macro photography nuts. Tulamben and the Liberty Wreck – Home to one of the Bali’s iconic site, the Liberty Wreck, Tulamben is a quiet village located on the north east coast of the island under the shadow of Mt. Agung. With a great mix of drops-offs, coral gardens, and black sand sites, the Tulamben area is one of the most photographically productive areas in Bali both on land as well as underwater. With three great sites just walking distance from the resorts, the diving here is convenient and easy, especially for night dives. For the more adventurous, a variety of pristine sites are just moments away via local boat. This area is perfect for both macro and wide angle photographic opportunities and is one of our preferred destinations for teaching photography. 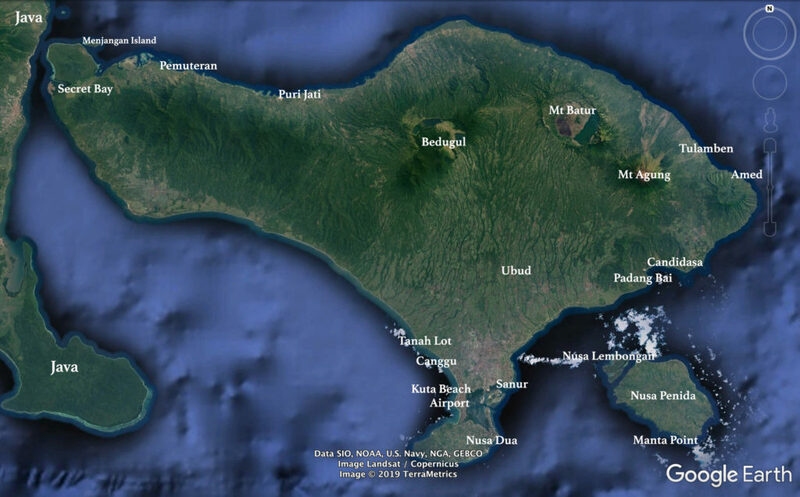 Seraya – Located just a few miles to the south of Tulamben, Seraya is one of the hottest muck diving locations in Bali. Located beside a dry riverbed, the black sand in the area is “chock a block” with interesting critters of the small variety. Frogfish, harlequin shrimp, ornate ghost pipefish, seahorses, and boxer crabs are just a few of the interesting creatures to be found in the area. There are several different dive sites in this strip of beach and all of them are very productive for finding weird and interesting critters. Seraya is always one of the favourites of our camera toting guests. Padang Bai and Candidasa – Located only a 1 hour drive from Sanur, the reefs around Padang Bai and Candidasa offer a wide variety of both macro and wide angle photo opportunities. Candidasa is home to several sites with good opportunities to find white tip sharks and possibly Mola during the right season, but the currents can be strong! Padang Bai has some great critter and macro photography dives and is a great place to dive that is not far from Sanur, a perfect way to end a diving safari. Nusa Penida – A set of three islands just 45 minutes from Sanur by speedboat, this area is home to some of the healthiest coral reefs found anywhere around Bali. With the right current running, this area is one of the fishiest in the area and is also where the “big” fish can be found: during the months of July – November the elusive Mola can be found at several sites around the islands and Mantas are found here all year round! For an action packed day of diving adventure this is the place to go. Be prepared for cold water in the high season as temperatures average around 23C here with temperatures of as low as 16C not being uncommon!